Most cycling computer purchase decisions made these days begin with the same basic question: is it as good as a Garmin? Competing manufacturers may not like to admit it, but the word Garmin has become nearly synonymous with “cycling computer.” Luckily, this market dominance hasn’t scared away all the competition and cyclists still have options. Polar, the company credited with inventing digital fitness performance tracking, has rolled back into the cycling computer game quite nicely with the GPS enabled M450. 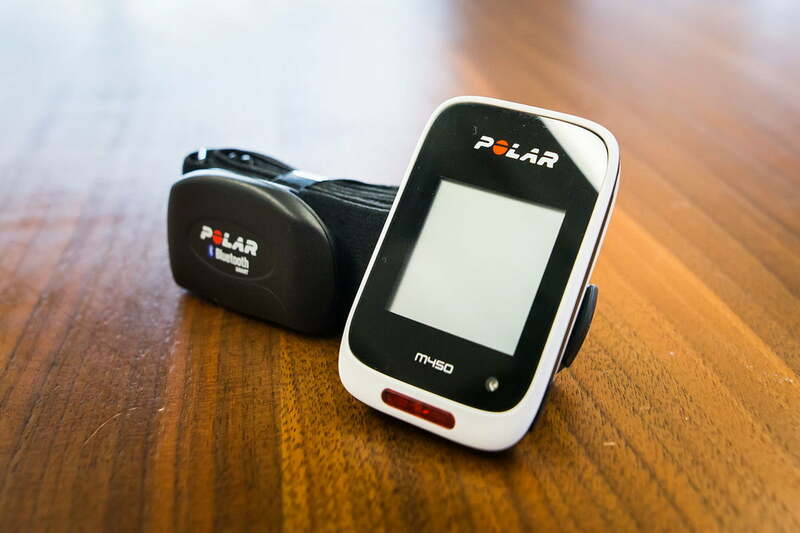 Polar didn’t reinvent the GPS cycling computer design with the M450 and kept it standard with a functional, thin, rectangular shape that leaves the M450 looking, well, almost exactly like a Garmin Edge. The sleek, aerodynamic, white and black plastic M450 weighs 51 grams, is 14 mm thick, and features a 3.5 x 3.5 cm, 198 x 198 pixel monochrome LCD display. Inside the M450’s case Polar has included GPS, a barometric altimeter, and 64 MB of flash memory for storing fitness metrics, ride routes, and training data. Interacting with the M450’s menus and settings is done with five buttons: one on the face of the device, just below the screen, and four edge buttons on the lower corners — one on each side of the screen and two at the bottom. The button on the face turns the M450 on as well as functioning as a select button for menu items. The right side and bottom buttons offer up and down menu scrolling, while the bottom left is the stop and back button. The left side button operates the M450’s LCD backlight. The back of the M450 features a circular interface that allows the computer to be twisted and locked onto a proprietary mount that can be attached to a bike’s stem or handlebars. Tucked in on the leading edge of the M450, Polar has included a LED light that can be operated manually or set to automatically turn on at dusk or night. It can be set to constant or as a blinking light. The M450 has everything needed to track road and indoor cycling, mountain biking, running, and walking. It also connects via Bluetooth to compatible sensors for displaying and logging metrics like cadence, heart rate and power. All these metrics can then be uploaded to Polar’s web portal via a USB cable when attached to a computer or over Bluetooth to a smartphone running Polar’s Flow fitness app. In addition to activity metric recording the M450 also includes two built-in training tests that work in conjunction with a Bluetooth heart rate monitor: a fitness test which provides Polar’s version of a V02 Max called the “ownindex,” which can be used to compare fitness over time, and an orthostatic test that measures resting, standing, and max heart rate over time to help cyclists avoid over training. The M450 we tested arrived with the cycling computer, a mini-USB cable for charging and connecting to a computer, a Bluetooth heart rate chest strap, and a getting started guide. 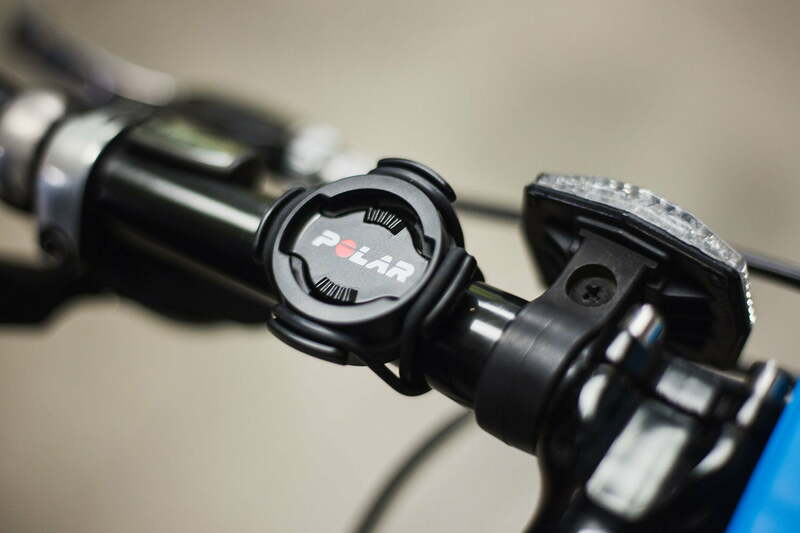 Polar also included a mount for attaching the M450 to bike handlebars or stem and three rubber bands of varying sizes to insure a perfect fit. Setting up the Polar M450 was a bit more complex than we expected. It requires a wired connection to a computer and then downloading an installer app from the Polar Flow website. Once we had the app downloaded and installed we plugged the M450 into the computer via the USB charging cable. The FlowSync app lead us through creating an account on Flow (Polar’s web fitness community) and made sure the M450 was running the latest firmware. During sign up we were asked to provide personal information like age, height, weight, training background, max heart rate, and a daily activity goal. Once our account was created on the Flow website we then went to our phone and downloaded the Polar Flow app (available for compatible Android and iOS devices) and signed in to pair the M450 with the phone. Having to use both a computer and smartphone plus downloading and installing two different apps before going for a ride was a little much, but it was straightforward and did not result in any major errors. . . thankfully. As dedicated Garmin users we were pleasantly surprised by the Polar M450. Cadence and power meter sensors usually stay on one bike so it’s a good idea to set up a different bike profile for each bike. Three different bike profiles can be created on the M450. This way, the M450 knows which sensors it’s looking for when it powers up. Having different bike profiles also allows Polar Flow to keep track of how many miles are logged on each bike. One caveat is that the M450 is Bluetooth only. That means that it cannot connect to any sensors that operate on the ANT+ communication protocol popularized by Garmin. After setting up the digital side, attaching the M450 to the bike was simple. The included twist mount and retention bands created a clever, solid, and secure attachment to our stem and provided a fit that could survive even the roughest abuse a mountain bike ride could deliver. We used the provided mount because Polar’s twist-on connection is not compatible with the bar forward mount we use with our aging Garmin Edge 500. Starting a ride on the M450 is simple. Press the red button to turn the device on, use the side button to scroll to the proper activity and press the red button again. The M450 found the GPS satellites in under 30 seconds and we were rolling. On our first ride there were some things we had to adjust to. We like to have a screen full of metrics rolling during a ride. The main screen data set on our Garmin Edge 500 displays cadence, speed, distance, heart rate, and time of day. The M450, however, displays a maximum of four metrics on each data screen, or “training view” as Polar calls them. On the ride we found ourselves constantly searching for that fifth data point, and ended up scrolling through the stock views trying to find a screen with data we wanted. Once we returned home and back in front of a computer we were able to visit the Polar Flow website and customize the M450’s training views. Anyone who has experienced the button pressing nightmare of customizing data fields on a Garmin 500 will find the M450’s web-based setup a breeze. With a couple clicks from the main menu it’s easy to get into the Flow “sports profiles” section and edit the stock training views or create completely new views. The M450 can store up to eight different training views and each view can display from one to four metrics. While we couldn’t get five metrics on one screen, by customizing the training views and placing them in the correct order we were able to get to the metrics we needed with one click of the down arrow button. The unspoken reality in cycling is that the only reason many riders own a GPS bike computer is so they can post their rides on the Strava online cycling community. Thankfully, Polar and Strava have made uploading rides a painless process. On the settings section of our Polar Flow account we were able to connect Polar Flow directly to Strava, Training Peaks, and/or Facebook so that as soon as a ride is completed and synced the data is made available on our social streams without having to connect the M450 to a computer. We did have one issue with syncing, however. Polar makes putting the M450 into sync mode simple — one long press on the M450’s bottom left “stop” button begins its search for the connected phone. The problem we had on our iPhone was that the Polar Flow app had to be active and running before the M450 could find the phone. Not a big deal, but not easy to do at the end of a ride with one hand on the bars and the phone still packed away in a back pocket. Speaking of back pocket, there is one thing the M450 doesn’t do that we wish it did — smart notifications. It connects to a phone via Bluetooth for syncing, but the M450 does not deliver notifications, incoming phone call alerts, or text messages to the display. This may be a deal breaker for those who depend on their cycling computers to act as a second screen for their phones. Others may argue that riding a bike is not the best time to be reading texts or responding to phone calls. Fair enough. So, bottom line, is the Polar M450 as good as a Garmin? As dedicated Garmin Edge 500 users, we were pleasantly surprised by the M450. We found its feature set to be an upgrade from our old Bluetooth-less Garmin and the M450’s wireless sync meant not having to plug it into a computer to post a ride to Strava. The editable training views didn’t offer as much data on each screen, but they were much easier to modify than our Garmin’s. Having a programmable LED light right up front was another bright spot. Obviously, without smart notifications or a color LCD screen the M450 falls short of Garmin’s Edge 520 cycling computer, but the 520 costs nearly twice as much. For the money, the M450 is about as good as it gets. With updateable firmware and a parent company that seems to push out updates whenever their engineers have a fix or new feature to add, we believe the Polar M450 is in no danger of being obsolete any time soon. If you’re already using Polar’s Flow fitness tracking ecosystem with a heart rate monitor, running watch, fitness band, or bathroom scale, then definitely buy the M450. It is a quality cycling computer that can handle all the metrics that professional (and amateur) cyclists need to track and place them right into the Flow activity feed next to your walking, running, and sleeping stats. Best of all it does this at an affordable price: $170 for the computer, $200 with a Bluetooth heart rate chest strap. For cyclists new to tracking performance metrics the M450 is a good entry point. If, however, you’ve been riding for a while and your bike is already kitted out with ANT+ sensors then you’d be better off paying a little extra and going with a Garmin.